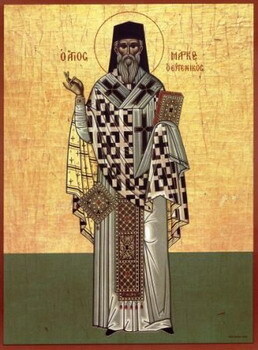 Saint Mark Eugenikos, Archbishop of Ephesus, was a stalwart defender of Orthodoxy at the Council of Florence. He would not agree to a union with Rome which was based on theological compromise and political expediency (the Byzantine Emperor was seeking military assistance from the West against the Moslems who were drawing ever closer to Constantinople). St Mark countered the arguments of his opponents, drawing from the well of pure theology, and the teachings of the holy Fathers. When the members of his own delegation tried to pressure him into accepting the Union he replied, "There can be no compromise in matters of the Orthodox Faith." Although the members of the Orthodox delegation signed the Tomos of Union, St Mark was the only one who refused to do so. When he returned from Florence, St Mark urged the inhabitants of Constantinople to repudiate the dishonorable document of union. He died in 1457 at the age of fifty-two, admired and honored by all. The Church has found you to be a zealot for truth. You cast down the darkness of boastful pride. Intercede with Christ God to grant forgiveness to those who honor you! 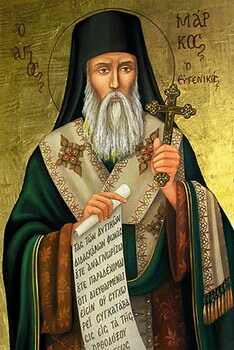 and shone forth as the champion of Orthodoxy. Therefore we cry to you: "Rejoice, Mark, the boast of the Orthodox!"